Maybe I’ve watched too many old movies but there still seems something impossibly glamorous about continental train travel. Whereas airports these days are all sweat and stress – stop here, queue there, shoes off, laptop out, shove all toiletries in that tiny plastic bag – sashaying onto a platform in Milan, even in a fake fur, feels definitely starry. It takes us ten and a half hours from Garibaldi station to St Pancras via Paris, eleven hours if we add in a couple of Milan Metro stops from our hotel. This was obviously much slower than our outward journey from Stansted which, with transfer and check-in times, took about six and a half but it was so much sweeter. We headed out through the suburbs to Turin with views en route of distant mountains and then through the Alps themselves, emerging from tunnels to see dramatic peaks and spectacular gorges, mountain streams and waterfalls, hilltop villages and the odd ruined castle. Out of one window was a beautiful white river, out of the opposite a motorway. Looking at its traffic only made us feel even more indulged. 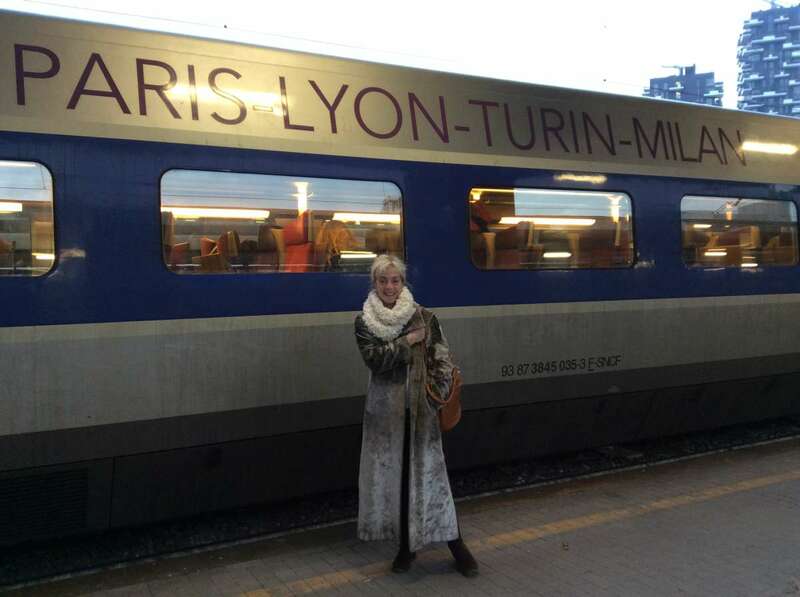 It was three hours to the French border – customs men simply strolled through the carriage without apparently checking anyone for anything – and then up through Aix-les-Bains, Macon and Le Creusot to the Gare de Lyon. There seemed to be dozens of helpful English-speaking staff on the station who could direct us to the right line for the Gare du Nord and from there it was Eurostar home. Throughout the journey, of course, we could chat, read, eat and drink, snooze, stroll around or simply stare out at different landscapes and human habitations. There were no jarring mobile phone calls either: everyone seemed to obey a request to use them only in the carriage vestibules. The only disappointment was that first class did not bring anything complimentary. Every last coffee had to be paid for and €17.80 bought two only fairly ordinary courses and a small bottle of wine, albeit served with charm, and I rather regretted not assembling some delicious Italian picnic to take on board. 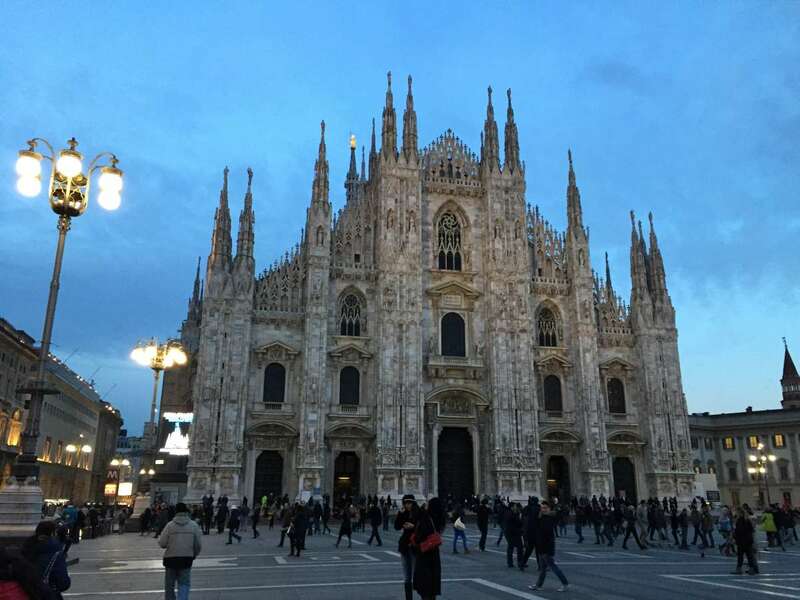 The journey came at the end of four day break to Milan, Brescia and Lakes Garda and Como where we aimed to get a feel for the city and some of the Lombardy region before the massive influx of visitors who are due between now and the end of October. More than 20 million are expected to travel to the specially constructed site a couple of miles outside the city: 60 countries are building their own pavilions, dozens more will be part of ‘themed clusters’. This latest great exhibition – the first was Britain’s in 1851, the last in Shanghai five years ago – will have food as its topic and explore every aspect from taste and enjoyment through history and cultural importance to how to feed the world in the future. Even without such a major event, Milan is a busy and buzzing city – creative types have flourished here from Da Vinci to Versace – so a day and a half can only offer the briefest sampling but we managed to fit in a few must-sees. Sadly these did not include Leonardo’s The Last Supper (now dubbed by some the ‘Lost Supper’ because, despite all the expert help in the world, it’s still fading) as the gallery is closed on Mondays but we did go to the grand Castello Sforzesco which has Michaelangelo’s unfinished Rondanini Pieta – apparently the artist was working on it almost until the day he died – and the staggeringly beautiful Duomo, a Gothic masterpiece which took six centuries to complete. Wandering around the roof with its glorious spires and views over the city was unforgettable. We also caught a behind-the-scenes tour of La Scala (home to one of the world’s most sophisticated and critical opera audiences) and strolled through the Galleria Vittorio Emanuele II which housed the original Prada shop and is now home to dozens of top names. 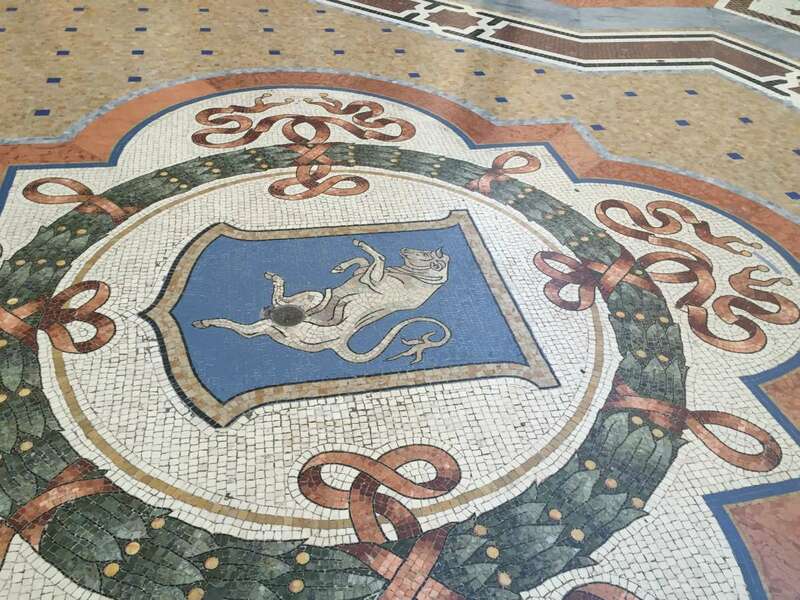 Under the great glass dome in the centre we paused to follow the Milanese tradition which says that turning round three times while grinding your heels into the mosaic bull on the floor brings good luck. Our luck certainly held for the other places we visited. 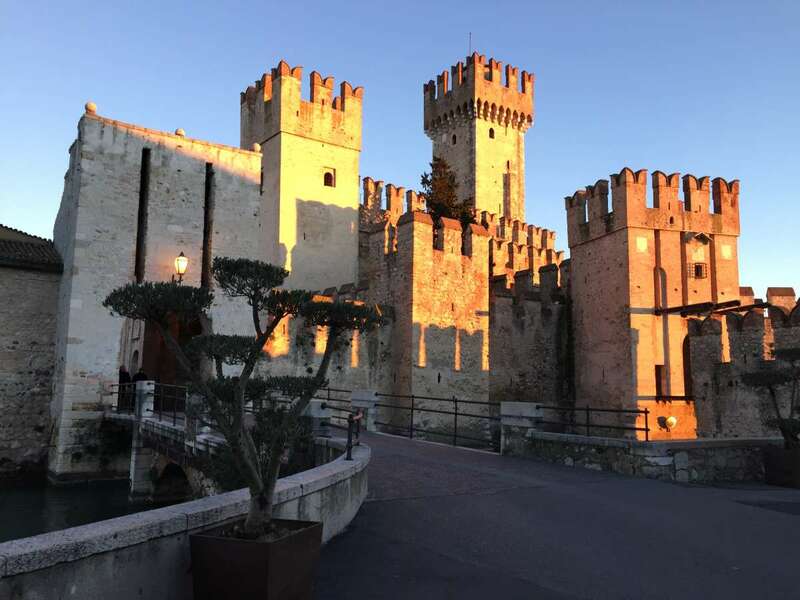 Brescia, about 60 miles from Milan, has a UNESCO World Heritage Site comprising the San Salvatore-Santa Giulia complex and the Capitolium archaeological area which together make up a huge museum covering 14,000 square metres with 11,000 exhibits. Ones that stuck in my mind included Roman mosaics (floors of ancient villas have been uncovered with barely a piece missing), the beautiful Winged Victory bronze, (cast in the first century but only rediscovered in the 19th so well had the locals hidden it from the Hungarian Lombard invaders) and a mediaeval cross covered not just with hundreds of semi-precious stones but with little cameos and miniature portraits too to give it a human dimension as well as a religious one. There were also some stunning frescos on the walls of the Benedictine nuns’ choir and the chapels of the two churches within the complex. It was then on to Lake Garda and the lovely little town of Sirmione reached across a drawbridge in the walls of a 13th century castle where we just had time to wander the pretty little streets and pause for mock arias outside what was once Maria Callas’s home before sinking into the thermal spa pool of our hotel to gaze from its steamy mineral rich waters up into the velvet night sky. Next day we drove to Como for a mooch round the town and a very enjoyable cruise up the lake with the guide telling us not just about the history, geography and culture of the place but also what we really wanted to know: which exactly was George Clooney’s villa.